With the capacity to accommodate 120 people in the audience, Antiba Theatre was replaced the chapel in the heart of Old Town. The theatre is an artistic house that encourages theatrical creation. It also offers training in drama and public reading for contemporary authors and matinee shows for younger audience. Timings solely depend on the shows. Please visit the official site for additional information. Ticket prices are starting from €14. Ticket price may differ with different shows. How popular is Antibea Theatre? 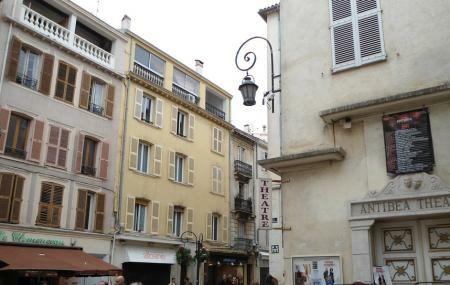 People normally club together Marche Provencal and Notre-dame De Bon Port while planning their visit to Antibea Theatre. People also prefer to start their day with Antibea Theatre. Nice area of Antibes. Very busy in summer. Tres joli petit theatre . Programmation classique . Nous avons rencontré les acteurs après la représentation. Très bonne soirée. Soirée au théâtre Antibéa Antibes entre amis très sympa. Nous avons été voir la pièce de théâtre ( un songe d'une nuit d'été) ,très bien joué par 18 acteurs. Petit théâtre très convivial. Je vous le conseille car vous ne serais pas déçu. Prix Adultes 16 euros, enfants 10 euros, sans emploi 14 euros.